Earlier in the month I wrote a blog about metrics for a help desk service center. Soon after I received a request to provide the top metrics for a call center. This is a larger subject than will fit in a traditional blog so I am including it in my monthly email message. To be clear there is no single metric or statistic that is the panacea for the call center manager. However, there seems to be a trend where certain metrics have favor over other metrics. Back in the late 90's I recall Service Level as being the most important metric for the call center. More recently it has been metrics such as FCR (First Call Resolution), CSat (Customer Satisfaction) and AHT (Average Handle Time). Now AHT has lost its luster and some managers are wondering whether CSat is a valid metric. If there isn't a single metric that everyone should use then there might several metrics that managers use. So I tallied the metric requests from 100 random Spectrum customers from the last 12 months. This table shows the top ten metric requests from Spectrum customers. These metrics are for ACD's only and do not include other data sources such as WFM, CRM, IVR, FCR or CSat. These metrics are for the Skill (group) level and do not include agent metrics. 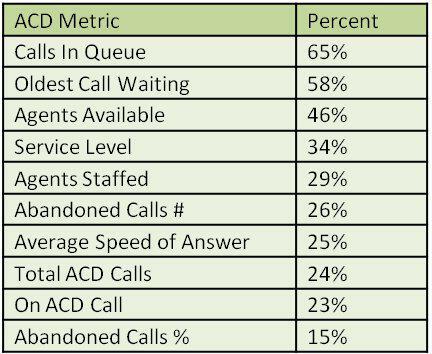 To read this table - 65% of Spectrum customers selected Calls in Queue as one of their metrics to be reported on, 58% selected Oldest Call Waiting as one of their metrics, and so on. I wanted to know more about why these metrics for the skill (group) were selected by the call center managers. So I called on a few Contact Center Managers and asked for some feedback. An on line retailer suggested that the calls in queue, number of abandoned calls and oldest call waiting were extremely important to her call center. "With the economy the way it is we cannot afford to miss one call or keep people waiting. They [the customers] might hang up and never call back and we do not want to lose that revenue. We also know from experience how long the average customer is willing to wait before abandoning the call so we keep the oldest call waiting up on the wallboards. Our agents know when that call is getting up to 25 seconds old they may lose that call." 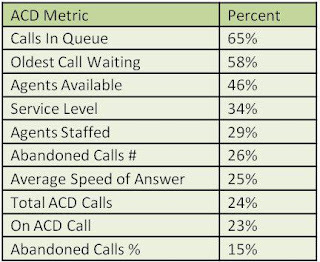 Some call centers do not see calls in queue or oldest call waiting as an important metric. A manager of a free technical support hotline explained it this way. "We have a free technical support line and we have a Gold Support line [that customers pay for support]. For the free technical support lines the number of calls in queue and the wait time are not important to me. For those [free support] calls I am more concerned about the total number of calls received and the [number of] agents staffed." If a single call center metric is not something that can be agreed on then possibly the use of a balanced scorecard is the solution. To create a balanced scorecard select 5 -6 metrics based on your company goals and determine your current status for these metrics. Next provide a weight (level of importance) to each of these metrics and compare your status against industry benchmarks for these metrics. You can also use your own company benchmarks instead of industry benchmarks. A scorecard takes multiple metrics to create a status single number for your call center. Over time a manager is able to see how the call center has performed. There are challenges with scorecards that have prevented wide spread acceptance. * The managers reluctance to find out how well the contact center is performing. A single universal metric that all call centers must use to determine the efficiency and effectiveness of the call center does not exist. Each call center manager must decide for themselves what are the best metrics to use and track for their call center. A balanced scorecard may help the manager be able to trend how the contact center is doing against other centers and over time. However, complete information and trust in the benchmark numbers must exist for the scorecard to be accepted and used. Spectrum is a leading provider of Unified Contact Center Reporting. Contact Spectrum today to learn more about Top Call Center Metrics.